I took a long walk by myself today. I had been waiting for this walk all my life and it was everything I ever thought it would be. Most people plan for success, many plan for happiness, and the rest plan for difficult-to-achieve goals. I took a long walk to plan for balance and self-actualization. Now that I'm not working full-time, there are too many things I can make myself busy with. Most of the things I want to do are computer-related and if my past-experience is any indication, they will bring me temporary excitement, momentary fame, and years of bug-fixes, feature-requests, and unpaid tech-support emails. In short, every new project I pick up comes with life-long baggage and even though I love these little things, they prevent me from doing the big things I really want. My daily chores would fit between 6am-7am and 7pm-11pm. All my interesting projects would be during 8am-6pm. Once a month, I will reevaluate my open projects and make changes to my schedule as needed. As of right now, I have prior commitments for Monday and Wednesday, at least till the end of this year. This leaves five days where I can do anything I want during the day. These five days were the most difficult to allocate. While I'd love to spend all of my time working on cool web apps like most of my projects or ZetaBee, I came to a realization that this is a never-ending, never-finished list. These projects have brought me immense joy and experience but have also taken up a lot of my free time in the past. Additionally, these projects also conflict with my nature adventures. I want to go kayaking all day or hike a long swampy trail without feeling guilty that I'm not working on x-y-z. Then there is a big issue of getting in The Zone, "a phrase used by software developers to mean the ultimate level of mental focus." Working on six different projects in the same week basically means you don't get in the zone for any of them - too much distraction and shallow focus. I want the ability to get in the zone so I can do something with absolute concentration and utmost dedication. My solution is to split the projects into (a) ONE-BIG-PROJECT and (b) everything else. The one-big-project is what I'll work on during Thursday-Sunday so I can get in the zone. Everything else goes to my "Too-Much Tuesdays" bucket. Every Tuesday, I will get to pick what I want to do that day. If I need to work extra on a project because of prior commitments, I can do that. If I want to go kayaking, hiking, or just have a Star-Trek movie marathon, I can do that. If I want to take a day-trip with Juliet, I can do that. My goal is to stick to my weekly schedule without fail and push anything that would prevent me from staying on track to the Tuesday bucket. This will free me from guilt, distractions, and unnecessary busy-work so that I can work on my one-big-project for days on end. For the foreseeable future, my one-big-project will be KType. KType will be a mix of software & hardware to help people with disabilities communicate better. I'm certain that I will be writing a lot more about it in the coming days. To make sure I stick to my schedule, I'm now tracking my time using Toggl.com. If it works well for me, I will write about my experience and methodology. Personally, I've never been too obsessive about following a routine and as long as I stick to my general schedule, I'll be more than happy. The goal here is to not stick to schedules but to create new, useful tools that help others. 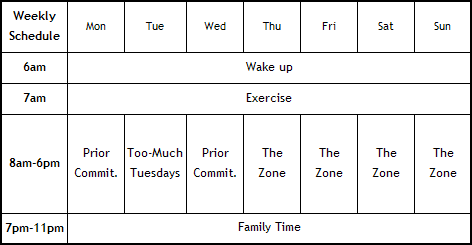 The weekly schedule, time tracking tool, and all these plans are just to make sure I don't go off-track, broke, or lazy.